Directions: Highway 401 to Prescott, south on Edward Street and turn left (east) on James, follow and watch for signs on the south side. 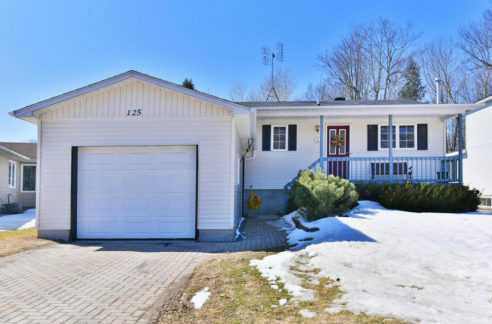 Public Remarks: Within walking distance of all amenities this property is located in Prescotts East end area, featuring a fabulous yard with vegetable garden, partially fenced and level. Easy access to 401 and 416 – beat the Ottawa prices, live in Prescott and drive to work. Or drive to Brockville, 1000 island bridge within 20 minutes. This home features a large kitchen, spacious living room and dining room with second floor, 2 bedrooms and bathroom. Large detached barn/garage with separate hydro, heater (as is) and huge loft. This is a dream workshop for the most discerning hobbyist or mechanic. The potential of this building is endless. Sellers will not respond to offers before April 8th. Allow 72 hours irrevocable. Seller Schedule B to accompany all offers. Buyers to verify taxes and any rental equipment, parking and any fees.